The Alliance for an Inclusive Middlebury works to promote a collegewide approach to issues of diversity, access, and equity. 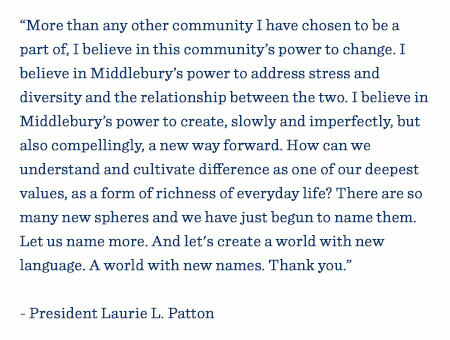 President Laurie Patton often speaks to this community about inclusivity as an everyday ethic, and she believes every one of us can be part of creating a better Middlebury. Through strategic planning and programmatic development, AIM will help the community foster an inclusive campus so that no one should experience it as an outsider. Regular progress reports to the president and Middlebury’s Senior Leadership Group, as well as to the broader campus community when appropriate. Initiatives created in collaboration with the widest possible range of campus constituencies. Research and exploration of best practices at peer institutions, possibly including site visits. Updating and sharing existing institutional diversity data and statistics with relevant offices on campus to identify areas for improvement and also acknowledge progress.